The way it works in a small school like mine is that, more often than not, teachers’ classrooms get switched year by year. This is due to a few factors – class size, overall student population, schedules. 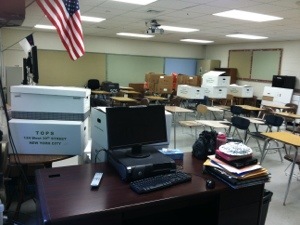 However, I’ve been among the lucky few that have had the same classroom for 11 years. My first year teaching, just like all the rookie teachers, I was a ‘traveling’ teacher, meaning that I was lucky if I had two classes in the same room, let alone all of them. But after that year, room D-140 was my home. D-140 wasn’t perfect. First, there were definitely climate control issues. No matter what, I was always cold. In the winter, I kept a space heater under my desk. In the spring, when the A/C kicked on (yes, I know, we have A/C. I shouldn’t complain), it felt just as cold as it did in the winter. Some years, I literally wore winter clothes all year round. Other years, I begged the custodians to set the A/C temperature high enough that it would have to be pretty hot before it kicked on. I preferred that over the Arctic freezes, though; if the A/C was set just one degree cooler, it would just blast cold air, non-stop. What about my big window, you ask? It was an emergency exit – we weren’t allowed to open it. Security threat. D-140, even with its perks, got a little run-down over the years. They pulled off some plywood above my board (yes, plywood), to set up a DVD system, which revealed a musty, smoker-teeth yellow, different than the foamy green on the plywood and the non-descript beige on the walls. There was a big hole above my door, where, I’m guessing, was an old bell or intercom system. There were some permanent black stains on the back wall, the cabinets hung a little crooked, and the whiteboard had a big pock-mark that looked like a meteor crashed. Up until a year ago, I still had the same pull-down screen that was from the old district we purchased the building from. In 1987. As much as I tried to decorate – paint my bulletin boards, bring in plants, hang pictures and posters, the room just never looked neat or pretty. Just white-trashy. There was also the distraction factor. D-building had gotten a little noisy over the years. There have always been lockers outside my room, but this year, they were 6th grade lockers…sixth graders who go to their lockers every forty minutes….sixth graders who don’t realize that not everyone is on the same schedule as they are….sixth graders who talk and act like they are in a contained classroom…sixth graders who have to come in for recess on rainy days and thus have the lunch aides yelling and monitoring them as they bounce between the two rooms. Yeah, didn’t really make for the most conducive learning environment for the high school. Because of the plans for next year, which all started because we needed a second 1st grade classroom, many classrooms were thrown up in the shuffle. So when I was told that I was vacating D-140 to be moved upstairs to the science wing (to a beautiful newly built room with a wall of windows), I was not upset. At all. “Awww, Katie- will you miss this room?” “Nope,” without batting an eye. What I was upset about was the idea of sorting through and packing up 11 years of books, lesson plans (yes, I still had some from as far back as ’03), files, material. That was daunting to me. (it was her room). I shared it with Josh, who actually was my former student – a senior during my first year of teaching; with Karen, who has become one my closest friends – I think that may have been the start of our friendship; with Eve, one of my partners in the English dept. I will miss those memories. *Things I’ve learned from watching other teachers teach in my room: Bob and his insights in the Bible course; Eve, man-handling a very challenging class of college English; Franshuas, our soft-spoken Spanish teacher (who also was a former student) and her fiery side when her 9th graders got out of line; Heidi, who taught health in a way that was as unique as her personality. I will miss those memories. *My student teachers: I’ve been lucky enough to have two in my career: Jane – polished, dignified, brilliant – who went on to study in England, teach at a local college and is working on her doctorate; Mike – who started as one of my former students (and my nephew, by the way) in 10th grade, miserable and so not wanting to be there; he ended up teaching English in my classroom, to my students and having the kids eating out of his hand (‘Mr. T is the best!’). Actually, now that I think about it, Jane was Mike’s student teacher! Seeing them both succeed – I will miss those memories. *Moments with my fellow teachers: Times when Nancy, our principal, would pop in to go over a “few” things; when Katie, another teacher in my dept., my neighbor in the class next door, and another one of my former students, would wander in and say, “Lannnnddryyyy, listen to this!”; when Mr. C would make sure he came by after school to talk me through – and pray me through – another crisis, both personal and professional; when Heidi would swing open my emergency window in the middle of winter because she needed ‘oxygen’ (that was before it was outlawed); when we would have teacher’s meetings in my room and I felt like I needed to clean up because I was having ‘company.’ I will miss those memories. 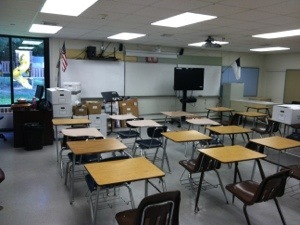 And, what would a classroom be without the students? I had lots of those in 11 years, but here are a few memories that stand out: Kim, who used to come and sit in the ‘blue chair’ next to my desk for our talks; the discipleship group of girls from ’06 – Kristin, Serena, Steph, Rachel, Rachel, Rebekah, Amanda, ChristaMarie and Krystal – who would come in during their lunch period so we could talk, pray, and do a Bible study together; Josh C. sitting on the back counter, chomping his gum and looking so angry that he had to be in school; Sarah, who would sit on my rolling chair (the blue chair is gone by this point), to talk and pray and ‘catch up’; Katie and Alexis sit on my floor and grade papers for me; the poetry class with the seniors in ’06, the only year we ever had that class – and it was because they requested it. I couldn’t have asked for more creative and enthusiastic group of students – and Buddy, performing his oral poetry reading with his soundtrack. Ahmazing. I still can hear the music in my head. And Rachel T, yours too. I remember the class of 2011, who for the epic video project, made an hour long movie, with just about the entire class. I was stunned. One of the best gifts I’ve been given as a teacher. I remember the huge card I found in my room the day after I came back from my grandmother’s funeral – from the Class of ’04. I remember a lot of laughs, teachable moments where they ‘got’ it, boring moments, kids falling asleep in class, never being able to create a good seating chart for some classes because they were all such good friends; I remember the monotony of grammar and regents review; I remember lively and fierce debates: Who is responsible for the Fall – Adam or Eve? or “Who was a better leader – Jack or Ralph? Does a person have to be moral to be a good leader?” I remember video projects on Huck Finn, Lord of the Flies, The Great Gatsby. I remember Angela’s detective project, CSI-style, and Stephanie’s sensitively created memory box from My Antonia. I remember being amazing at the creativity of the Tomasini sisters in every project. I remember finding balloons and flowers on my desk on the morning of Valentine’s Day, the first one when my husband and I were dating. I remember being so exhausted and frustrated leaving my room at the end of some days that I didn’t know how I’d come back in the morning. But I did. Every day. For 11 years. On June 20th, I closed the door behind me out of D-140 as I know it for the last time. 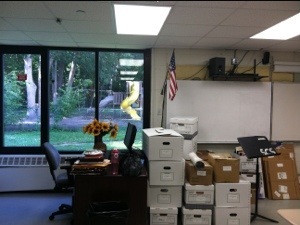 In September, it will be an elementary library, and I’ll be climbing to the 3rd floor to my new home. If the walls in D-140 could talk, I don’t know if they would remember things the way I did. But to D-140, I say – so long. Thanks for the memories. This is so sweet :) D-140 will never be the same! I know!!! Lots of good times!!! I'm glad you came by, boz!